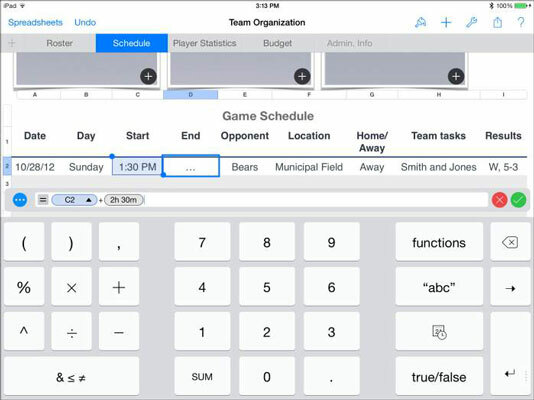 When you use the Numbers app on iPad, you may need to enter formulas. Tapping the equal-sign (=) button lets you enter a formula, which automatically computes values based on the data you type. The result of the formula can display in a cell in any of the usual formats, and that value can be used in a chart. When you’re entering a formula, the four buttons controlling the date-and-time, text, and numeric keyboards disappear. In their place, a button with three dots appears. Tapping this button returns you to the display that gives you access to the other three keyboards. This setup is just a matter of Numbers saving space. Formulas are accompanied by good news and bad news. The good news is that you don’t have to type many common formulas: Almost all spreadsheets have the same built-in list of formulas. The bad news is that the list of formulas is quite long. Formulas can consist of numbers, text, dates, durations, and true/false values. They can also include the results of formulas and the values of individual cells. This example, which presents the basics of creating a simple formula in Numbers, adds a number to the value of an existing cell and then displays the result in the cell that contains the formula. 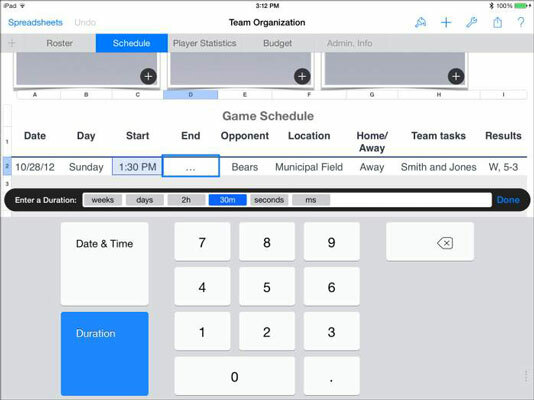 This example uses the Team Organization template. Rename the Time column Start. Add a column to its right and name it End. Select the cell in which you want to insert the formula by double-tapping it. The figure shows the End column cell next to Start selected. Tap the equal-sign (=) button at the top-left side of the keyboard. The keyboard changes to the formula keyboard, as shown in this figure. The table’s column and row frames now contain row and column identifiers. The columns are labeled A, B, C, and so on; the rows are labeled 1, 2, 3, and so on. Every cell can be identified by its coordinates (such as A1 for the top-left cell). Functions: Brings up a list of functions for use in formulas. abc: Displays the text keyboard. 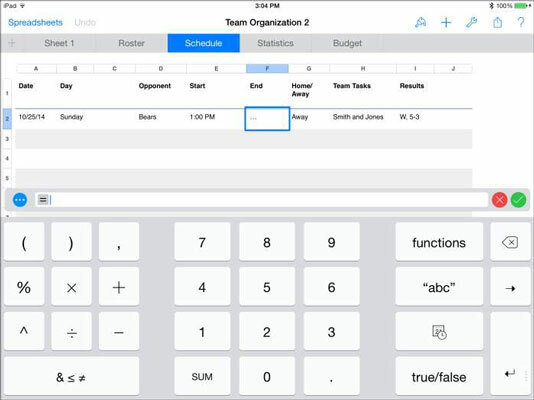 You can type text and tap Done, and the text is added to the formula you’re constructing. You return to the formula keyboard. Date/Time: Takes you to the date keyboard. When you tap Done, the date or duration is added to the formula, and you return to the formula keyboard. True/False: Uses the same interface as check boxes; the result is added to the formula you’re constructing, and you return to the formula keyboard. Add the game starting time to the formula. This references column C, row 2 in the Game Schedule table. You don’t have to type a thing — just tap, and the correct cell is referenced. You now need the formula to add 2½ hours to the starting time. Tap + from the operators on the left side of the keyboard. Tap the Date/Time button on the right side of the keyboard and then tap the Duration button at the left. On the Formula bar, tap Hours and enter 2. Tap Minutes and enter 30. This figureshows what the screen looks like now. You’re done entering the duration. You return to the formula keyboard. Finish the formula by tapping the button with a check mark on it. This figureshows the formula as it is now. Note that rather than seeing the Done button, as with other keyboards, you see a button with a check mark and a button with an X at the right. The X cancels the formula, and the check mark completes it. If you want to modify the formula with the keys (including Delete) on the keyboard, feel free.